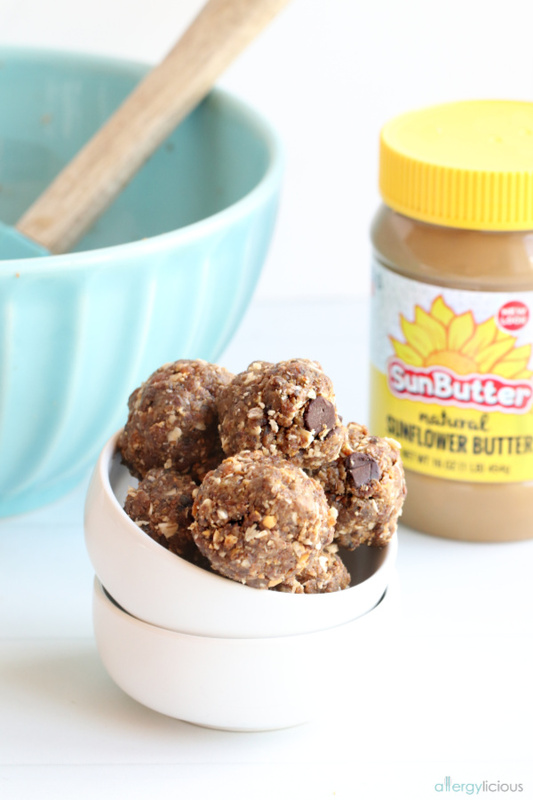 No Bake SunButter Energy Bites, loaded with SunButter, gluten-free oats, flax meal, and crushed pretzels. 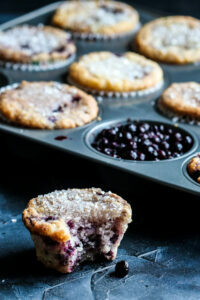 The make-ahead snack or lunchbox treat that’s vegan, gluten-free, and nut-free too! To say that we love SunButter, is an understatement! We use it in sauces, smoothies, protein bars, energy bites, sandwiches, cookies, waffles, and other baked goods. And, sometimes when no one is looking, it’s eaten by the spoonful. It’s a very sad day when the jar is empty…but thankfully, we always keep a backup ready (or 6) for when that day occurs . Seriously ya’ll, it’s just that darn good. This time though, I’m back to doing a healthier energy bite recipe which I know you will all love! 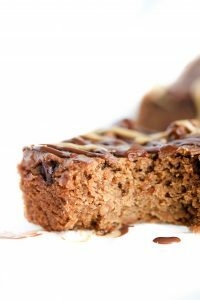 It is made up of wholesome gluten-free oats and ground flaxseed mixed with delicious SunButter, agave, and pretzel bits which creates the most scrumptious make-ahead energy bite. You guys!! These SunButter Energy Bites are sooooo good! 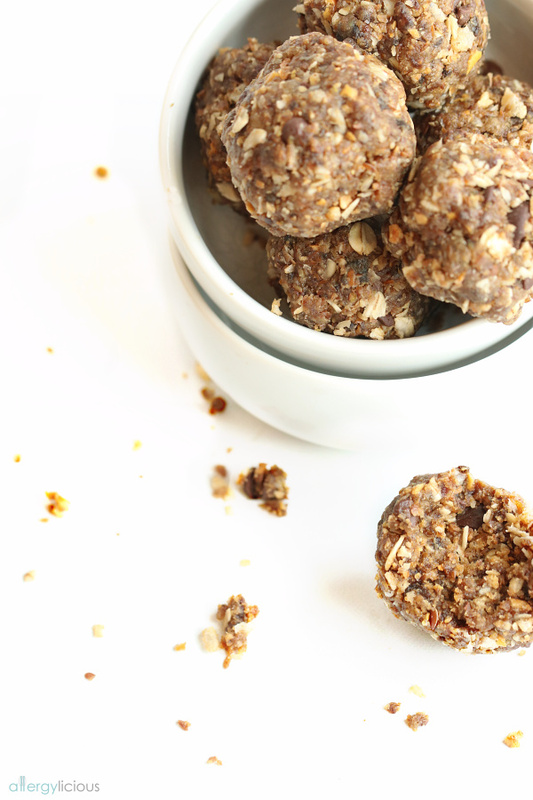 If you need a no-bake make-ahead snack recipe, then this needs to go on your menu, stat! Not only are these a perfect snacking treat for you, they are a great source of quick energy as your running to the gym and an awesome food choice to pack in your kids lunchboxes. Xander always grabs 2 when he’s packing his lunch and Cayden….well she grabs a few more because she likes to share them with her friends (or at least that’s what she tells me). At least they are eating a snack that’s good for them! AND it’s a snack thats really easy to make. Just blend, mix, and shape into a bite-sized snack but if you want proof, check out the video below. Dates: We always have them on hand but when I went to make another batch, I noticed we were all out. Thankfully, I had some dried apricots and those worked awesome! I just soaked them a few minutes in warm water to soften before blending. 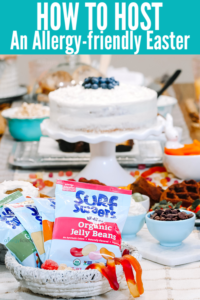 SunButter: I used their Natural blend, but they also have a Crunchy version which I used in my Crunchy Chocolate Sunbutter Cups which is another great choice here. Chocolate: Dark, milk chocolate, white chocolate….just pick your favorite! Pretzels: I love how pretzels bring a little extra crunch and salt to these bites, but if you look closely at the video, you’d notice there are no pretzels. Yep….I had a few mishaps that day while filming and ran out when I was in the middle of redoing a shot. Soooo, brown rice krispie cereal took it’s place and they were still delicious. Give them a try and let me know if you make any of your own customizations along the way. 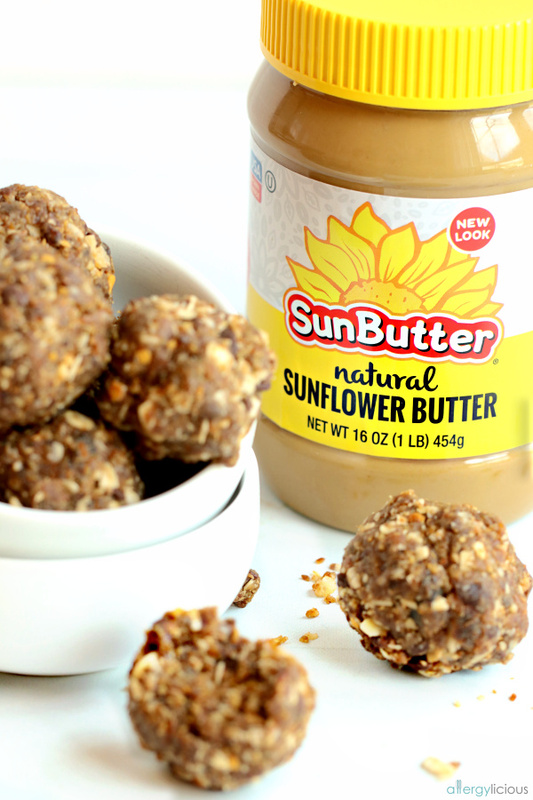 No Bake SunButter Energy Bites. Loaded with gluten-free oats, SunButter, flax meal and crunchy pretzel bits. 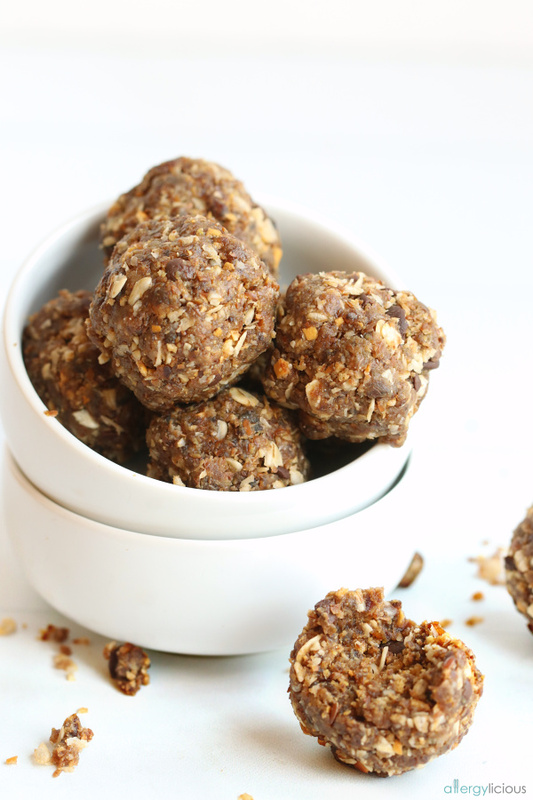 A healthy protein packed snack or lunchbox treat! In a food processor, pulse together dates, agave, SunButter, flax meal, and salt, 5 times and then process on high 20 seconds. Scrape down sides then add in rolled oats, crushed pretzels and chocolate chips. Pulse a few times and the process another 20 seconds on high or until blended. Measure into tablespoon size amounts then shape into balls. If too crumbly, add a little more SunButter or press into ball-shape instead of rolling. If you make this recipe, be sure to snap a photo and hashtag it #ALLERGYLICIOUS. I’d love to see what you make! Craving More? Check out these bite-sized snacks…. This sponsored post was created through my partnership with SunButter. As always, all opinions are my own. Collaborating with brands that I love and trust, allows me to keep bringing you new and delicious recipes. Learn more about why we love SunButter here . I love how easy to make these are! They seem like the perfect grab and go snack. I can’t wait to try them. You said it….these really are a perfect Grab-n-Go snack. Love love that you have used pretzels in these! I bet the crunch and saltiness they bring to the party is amazing! The pretzels do satisfy all those crunchy, salty cravings….that’s for sure. Can’t wait to make these. Nicole thank you for these wonderful recipes! i am totally loving the salty addition of the pretzels! Genius! Thank you! Since we cannot do nuts, pretzels are the perfect salty,crunchy substitute. Looking forward to giving these a go! Awesome Jules! I think you’ll love these. Wish I had a bowl of these right now. I’d share, of course!! I wouldn’t blame you if you didn’t want to though . I think I have most of these ingredients on hand right now. Looks like I’m going to have some tasty snacks in my house shortly! Mmm, more sunbutter that we love! and the pretzels – SO GOOD. saving this one to make as soon as I can! I can’t wait to make these! We made some SunButter energy bites last week, I think my kids will love your version with the dates and pretzels. It’s hard to resist a good bite made with SunButter, isn’t it? Hope your kids love these as much as mine do. Such a great healthy snack idea! I love the added crunch the pretzels bring! That’s my favorite add-in too! Now this is a winning flavor combination! I love chocolate, pretzels, and Sunbutter together. We will have to try these energy bites!! I can’t wait to try these. I have a long flight next week and these are the perfect snack for me to bring on the plane. My kids are huge fans of energy bites. They are perfect to snack on between all the running around we do. You’re so right…they are perfect just for that. You had me at crushed pretzels! I love the saltiness and the crisp texture in these. YUM! I love your addition of the pretzels! I bet they add the perfect salty to balance out the sweet! Pretzels do balance it out nicely!